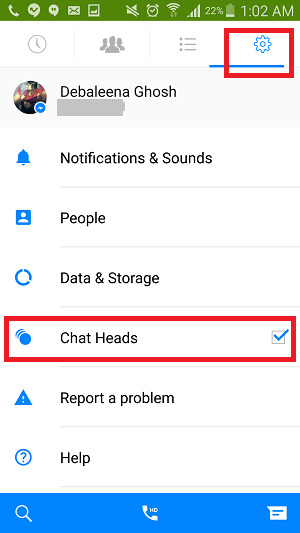 Home > Android > How to disable the annoying chat heads of Facebook Messenger? Facebook Messenger app for smartphones has chat heads that pop up from time to time whenever you have a new message from a friend. If you chat with your friends and you love chatting, then the Messenger chat heads are extremely useful for you. The chat heads appear as round buttons which pop up with every new message. You can move it from one side of the screen to another and exit it. The chat heads also display the message that has come across from your acquaintances which often becomes a reason of embarrassment. If you are showing some pictures or important documents from your phone to someone, then messages from your friends in Messenger will start popping leaving no space for privacy. 1. Open Facebook Messenger app and go to Settings. 2. Now look for the option call Chat Heads. There’s a check box beside it. Uncheck it and the feature will be disabled. 3. If you want to turn it back, simple re-check the option again.